To achieve our greenhouse gas reduction goals, we're supporting early champions in the zero emissions building sector. To support innovation in design and construction of multi-unit buildings that pursue zero emissions performance, the Zero Emissions Building (ZEB) tools are structured to help offset the modest additional construction costs as leading builders test barriers, stimulate ZEB building supply chains, and spark a new wave of design innovation. The current ZEB tools are focused on multi-unit residential projects as these building permits make up the greatest proportion of new floor area in Vancouver. These projects already undergo a negotiated process for additional density. To support rezoning projects that pursue Passive House or Zero Energy standard, instead of up to a 5% FSR increase, construction cost premiums for zero-emissions buildings will be incorporated into the rezoning evaluation process. The Director of Planning also has discretion to relax regulations for rezoning projects to enable zero-emissions buildings. Recently completed and under-construction projects show that it is possible to build high-rise and low-rise residential buildings to a zero-emissions performance level. A six-storey, 85-unit rental building in East Vancouver, that is pursuing Passive House certification. The six-story project will offer 95 rental homes in South Vancouver. If successfully certified, it will be the largest Passive House building in Vancouver and one of the largest in the country. The project at 855 Kingsway has an approved development permit for a 50 unit Passive House building. The Brixton is a multi-unit rental building that achieved zero-emissions by installing high-efficiency water heaters in each suite instead of using a standard centralized gas boiler. This table illustrates examples of additional floor area that a builder or developer may add to a proposed multi-unit project by designing and building it to a zero-emissions building performance level. These examples assume the proponent achieves the maximum 5% additional floor area in each case. This is at the final discretion of the Director of Planning. All City policies apply to additional floor area. We predict that the market for high-performance buildings will continue to grow. As the Zero Emissions Building Plan is phased in between now and 2025, the demand for green building design expertise, construction practices, and building materials will become standard for all new construction. 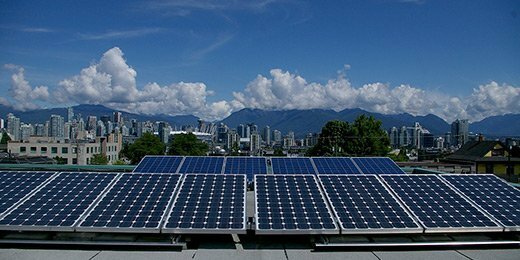 Advances in green building practices will support the provincial BC Energy Step Code implementation between now and 2030. Nearly 92,000 people already work in green architecture and construction services in British Columbia, according to a recent study . The World Green Building Council estimated that the global green-building market doubles every three years . The value of the global green building-materials market could reach $234 billion by 2019, according to one recent market forecast . Find resources and tools to help you construct a Zero Emissions Building.